Over the past 14 years we’ve worked with dozens of industries. Recently, we’ve decided to start focusing our marketing efforts toward specific industries that we enjoy working with—one of those is the medical field. In order to attract specific clientele we knew we’d have to turn our website into a laser-targeted marketing machine. We couldn’t just market to the broad audiences of digital marketing or web design, but instead we needed to speak directly to individuals in the medical field and establish ourselves as an authority in this niche. This gave us the opportunity to backup an article we published last October regarding how to use vertical marketing to generate more leads, even better yet, targeted leads. 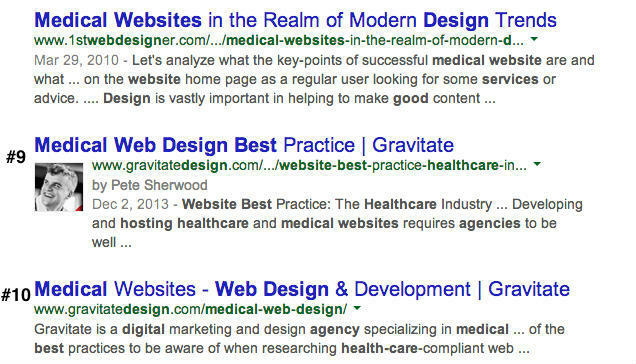 We gradually began ranking on page 1 for terms like medical web design, best practices for medical websites, best medical web design agencies, and more. Some of these ranked us on page 1 for multiple medical pages, see example below. 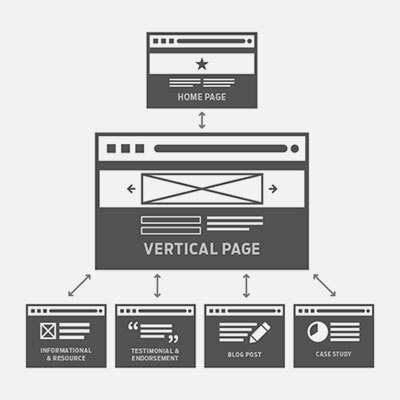 We followed the steps described in our vertical marketing article, including the linking diagram below, and then created semantically related page topics to support our target-landing page. Semantically related refers to pages with similarly themed topics and keywords. When visitors click through from a search they enter on a landing page specific to medical web design; welcome to medical land! The main landing page is supported by additional medical focused blog posts and resource pages, all of which link to the primary landing page—illustrated in the diagram to the right. This essentially created a micro-site within our existing domain. Keeping the landing page within your primary domain, rather than using a unique URL, is a good idea because it helps build targeted links and overall authority for the entire domain. Which, in the long run for us, is going to increase rankings for keywords outside of our medical terms too! Three months in we were seeing hundreds of monthly visits for terms like the ones mentioned above—some of which turned into highly-qualified leads and sales. Below is a screenshot of our Google Analytics traffic to show the gradual rise in visits to our medical pages over a four-month period. Need to print this post? Download a PDF here.